Microsoft is planning to make its entrance into the smart earbud market this year, according to Thurrott.com. The company's product would reportedly fit within its Surface lineup — which consists primarily of the Windows giant's tablets and laptops but also includes a branded pair of AI-equipped over-ear headphones — and could put it in competition with Apple and potentially Amazon in an increasingly active space in the market. Here's what it means: Microsoft's potential entry into the smart earbud space is puzzling given its recent repositioning of its voice assistant and lack of a mobile ecosystem. It's been moving away from promoting its Cortana voice assistant as a direct competitor to the likes of Siri and Alexa. The AI assistant hasn't seen strong adoption in the consumer space, and Microsoft has instead been moving toward an enterprise focus for the voice assistant to capitalize on high use in that segment. That could point to a similar focus for its earbuds, but it seems unlikely given the positioning of the device within the Surface family. Surface earbuds could offer a range of features to entice users, but Microsoft lacks a mobile ecosystem to bring them into. Based on what's already included in the company's Surface headphones, it appears likely that its earbuds could feature some degree of noise cancellation, one-touch or no-touch Cortana integration, and a feature to make reading and consuming content on mobile devices easier. But Microsoft isn't an active player in the smartphone operating system space after Windows Phone's demise, so it could face difficulty fully integrating any devices into the flow of consumption on mobile. The bigger picture: There's interest among consumers for AI-equipped earbuds and audio devices, according to exclusive Business Insider Intelligence data, which is why Amazon and Microsoft are both reportedly looking to offer devices in the space. 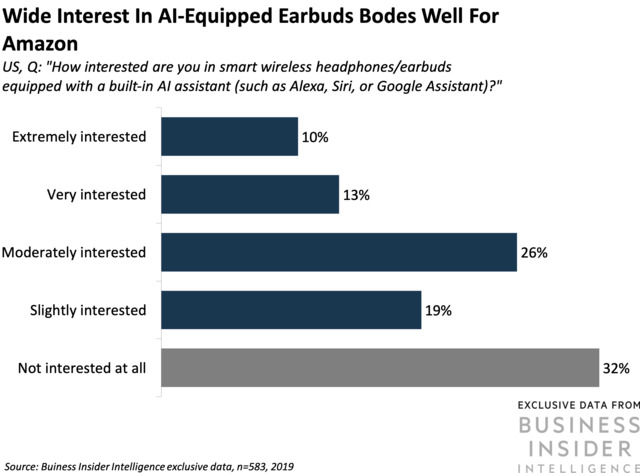 Nearly a quarter of respondents to a recent Business Insider Intelligence survey reported that they're very or extremely interested in AI-equipped headphones or earbuds, providing a promising customer base for such a device. But Apple's Siri was the most preferred option among the leading mobile voice assistants, trailed by Alexa and then Google Assistant, with others — including Cortana and Samsung's Bixby — far behind. Even if there is appetite for these sorts of devices as consumer accessories, all of the caveats and limitations that apply to Amazon and its lack of mobile presence also apply to Microsoft, and the latter also lacks the smart home ecosystem that Amazon has developed. Our exclusive data indicates that the AI-powered earbud market is oriented around mobile or home ecosystem builders, and Microsoft doesn't fit that bill.